Matilda: I would look at these women. These perfect, beautiful, just unbelievable skinny women. I just couldn't... Oh, I couldn't understand why I didn't look like them. I just didn't get it. So, um... So, I... I became... bulimic. Zoolander: You can read minds? Zoolander is one of the most mindlessly absurd and childish films I have seen in recent years, and I just so happened to thoroughly enjoy it. While I usually crave more thought-provoking entertainment, every so often I need a movie that allows me to turn off my mind and relax. Grossly lacking in substance, abundantly idiotic, yet genuinely funny, Zoolander is that movie. I was pleasantly surprised to find myself laughing out loud more than a few times. Ben Stiller stars as Derek Zoolander, VH1's "Male Model of the Year" three times in a row. His world comes crashing down around him when rival model, Hansel (Owen Wilson) steals his spot in the limelight. Even worse, Zoolander loses his only friends in a bizarre accident and destroys an opportunity to make amends with his estranged family. It would be incredibly easy to feel pity for him if he were not such a laughable goofball. Sensing Derek's urgency, the evil fashion authority, Mugatu (Will Ferrell), takes advantage of Derek's situation and offers him the lead modeling position in his next fashion campaign. Little does the feeble-minded Zoolander know that Mugatu is secretly brainwashing him to assassinate the Prime Minister of Malaysia. Zoolander all but tanked at the box office, and looking back on the film's synopsis, it is easy to see why. I certainly had no desire to see another brainless Ben Stiller project, much less one where he arrogantly casts himself as a "perfect" model. However, the film roots itself in a giddy craziness that never takes itself seriously, which is the redeeming quality that turns it from appalling to appealing. This is Ben Stiller's third time around as director, and while it seems he is getting the hang of it, he is still miles away from creating his first masterpiece. Here he smoothes out many of the directorial bumps that plagued the "is it supposed to be funny or not?" tone of The Cable Guy, but Zoolander remains rough around the edges. All of this project's flaws, however, seem to be counterbalanced with moments of enjoyable goofiness. The film's overly abundant cameos are delightful, especially those by David Bowie, Billy Zane, and David Duchovny, who exhibits a wonderful comedic subtlety. Stiller further increases the level of fun by consistently pumping pop music into the soundtrack. Though many of these songs are recent hits, there are numerous 1980s bubble gum classics as well, which heightens the sense of amusement. Stiller knows his film is an exercise in stupidity and never attempts to make a mountain out of a molehill. Yet, he has perhaps relied too much on his method of foolishness. In playing the title character, he uses an annoying accent that gets tiresome; his dialogue is more than enough to convey his lack of intelligence, and the attempt at this child-like voice is a blunder. Stiller's performance would have been more tolerable had he toned it down and relied more on his natural voice. I believe he could have learned a few things from Owen Wilson, who seems to find the right note between amusing and annoying. Many of the innumerable jokes do not work, but those that do are a riot. Despite its imperfections, the film never pretends to be anything but a comedy, which is unusually refreshing. Nowadays, so many alleged comedic films bog themselves down in the third act with a sappy attempt at heartfelt sentiment that is truly uninspired. 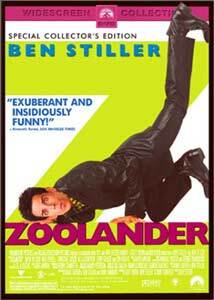 Stiller is clever enough to avoid this pitfall, a choice that elevates Zoolander. Bottom line, this made me laugh. I may not have been laughing the entire time, but I laughed enough to feel like a kid again, if only for a short while. Image Transfer Review: For a new Paramount release, I was expecting nothing less than a stunning picture, which is exactly what I was given. Colors are exemplary, appearing vivid and lifelike throughout. Black level is equally remarkable, with a deep and rich presence. Contrast is perfectly balanced in darker scenes, yet lighter scenes tend to suffer from an overbearing amount of white level as well as minimal amounts of the dreaded edge enhancement. However, any gripes I have with the image quality are minor, and overall, this is a stellar transfer. Audio Transfer Review: Zoolander boasts an impressive 5.1 Dolby Digital mix that creatively utilizes the capabilities of a multi-channel soundtrack. Fidelity is clean and clear throughout, and dialogue is always intelligible. Room-shattering bass is nearly non-existent, yet tones in the 40Hz range were clean and strong, particularly during the film's many punchy pop songs. Surrounds are moderately used with good taste, including aggressive split surrounds during several sequences. Never does the soundtrack become too flashy or gimmicky, which is saying quite a lot for a film that relies mostly on quirky flair to communicate its message. Also included are English and French Dolby Surround 2.0 soundtracks. Extras Review: Zoolander contains a wealth of special features that are all humorous and very creative. The only obvious mistake I can see is the lack of a theatrical trailer. The witty full-motion menus feature Ben Stiller, AKA Derek Zoolander, guiding us through the different selections while offering comical remarks on each selectable word. This is a nice effort that makes great use of interactive menu screens. The feature-length commentary by Ben Stiller and writers Drake Sather and John Hamburg is pretty stale. I was surprised to hear Stiller sound so drab; still, interesting tidbits of information are provided. Anyone who enjoys commentary tracks should take pleasure in this one. Next, is a section of five deleted scenes and five extended scenes, all of which have optional commentary by Stiller. Many of these are quite funny. While I do not think their inclusion is necessary, I would have actually liked to see them incorporated into the finished film. Stiller's commentary for these scenes is even more subdued than his feature commentary. His dreary speaking voice combined with his lack of interesting comments nearly put me to sleep. The outtakes section is a five-minute montage of bloopers and flubs. This crazy section is my favorite and proves to be a perfect companion piece to the film. Next are the VH-1 fashion awards skits. These are phony promotional spots that originally aired on VH-1 in 1996 and 1997, when Stiller first conceived the idea of Derek Zoolander. These TV shorts are incredibly entertaining, especially the 1997 Zoolander infomercial, which is not unlike the kind seen at 3 a.m. on obscure cable channels. After that is Start the Commotion by The Wiseguys. This typical music video features clips of the band interspersed with scenes from the film. The idea of a music video ties in nicely; it would have been nice to see a few more. The promotional spots are divided into three sections, the first of which is Public Service Announcements. Here Zoolander offers his wisdom into important issues such as racism, world hunger, and education. Next is MTV Cribs, which are three short commercial bits designed for MTV, very similar to the VH-1 skits. Rounding out the trio are Interstitials, which are nothing more than a collection of 10-second television spots. This section proves that Stiller went to great lengths to promote this movie. Everything is extremely comical, but judging by the success of Zoolander, I am wondering if he did not go too far. In the photo gallery we have Derek's Portfolio, Hansel's Portfolio and Zoolander Production Stills. The portfolios are still frames of fake model shoots for the two main characters. The stills are from the movie as well as behind-the-scenes. While I usually loathe photo gallery sections, the portfolios are incredibly creative and amusing. Closing out the special features is the Alternate End Title Sequence, which features a montage of random images. All of these senseless events are set to Frankie Goes To Hollywood's Relax, this time performed by Powerman 5000. Last but certainly not least, do not forget to search for a special easter egg on the second screen of the special features section. It is not difficult to find and certainly worth looking for, regardless of anyone's contempt for easter eggs. Regardless of what one might think of Zoolander's inanity, I highly recommend renting if not buying this DVD. With its brash sense of humor and variety of eccentric special features, it provides a long lasting, enjoyable, and much needed escape from reality.